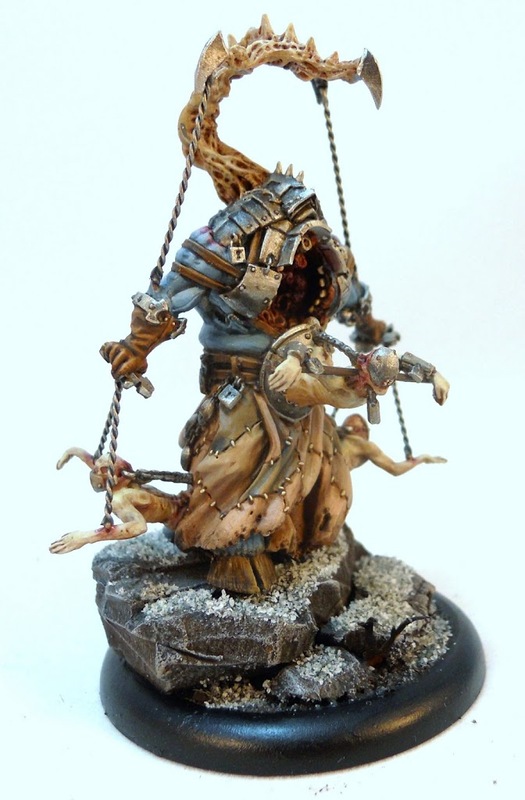 Another Hell Dorado painting article has been long overdue. 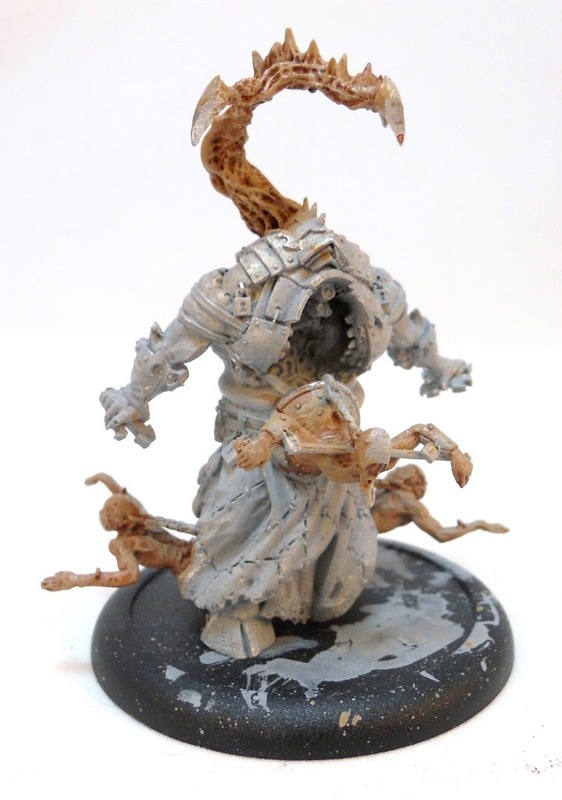 From my new Demons army, I bring you Eurynome. 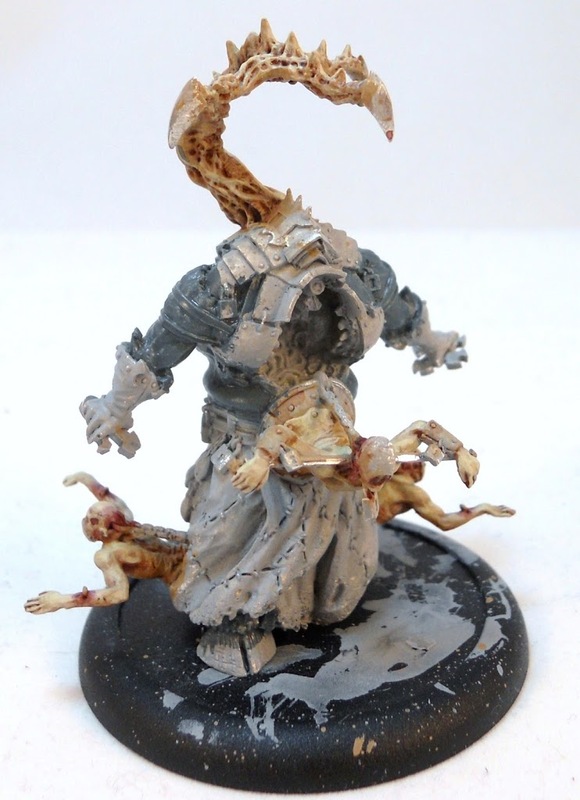 I love me some creepy minis. And given that I also love Hell Dorado it was really only a matter of time before I picked up a Demons army. Ok, ok… I’ve actually had this Demons army for awhile now. I’ve been meaning to paint them for ages, but it wasn’t until the very successful Hell Dorado Kickstarter that I felt inspired enough to push my other painting projects aside and finally get started on my own little traveling horror show. And what better Officer to start with than Eurynome? Even among an army of nightmarish freaks, this one stands out as particularly gruesome. Murdered by Samael under the direct orders of Lucifer himself, Eurynome has been returned to unholy life by unknown forces for unknown reasons. Yeah I realize that’s a little vague, but the fluff in the Hell Dorado book is all written as first person accounts by narrators who don’t always have all the facts. Sometimes you have to draw your own conclusions. It seems to me like there’s not much of the old Eurynome left. He was executed for being unwilling to abandon old feuds and unite with the rest of demon kind against the invading humans upsetting the natural order in hell. I think that bizarre talon/hand thing erupting from his back is running the show now… puppeting Eurynome’s animated flesh in defense of hell in a way he refused to do while he lived. In turn, what’s left of Eurynome puppets the enemies of the infernal realms. This is reflected with in-game abilities that are all about controlling enemy models. But enough back story… this is a painting article after all. 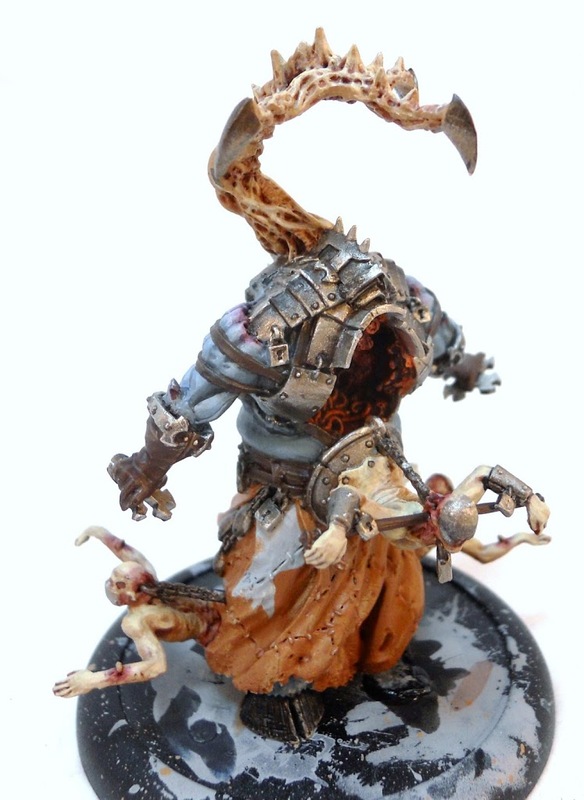 I start off by painting Eurynome’s little friends… and the strange flesh claw/hand thing protruding from his back. 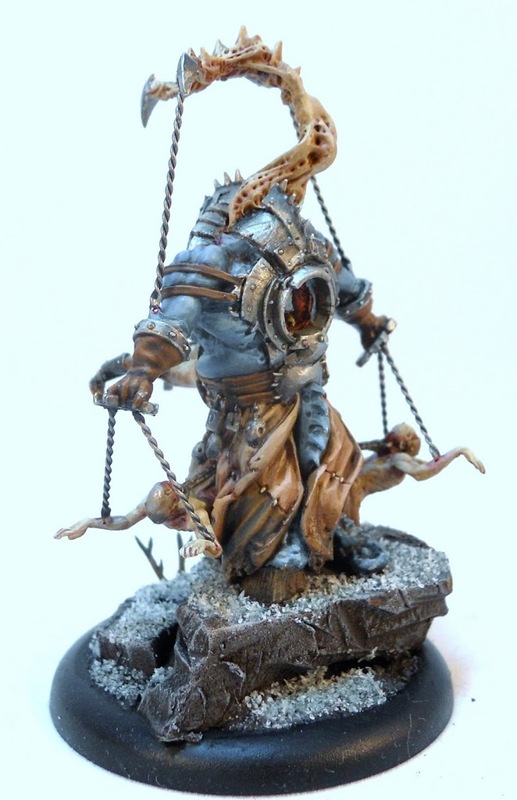 I basecoat them with a 50/50 mix of Frostbite and Menoth White Highlight. 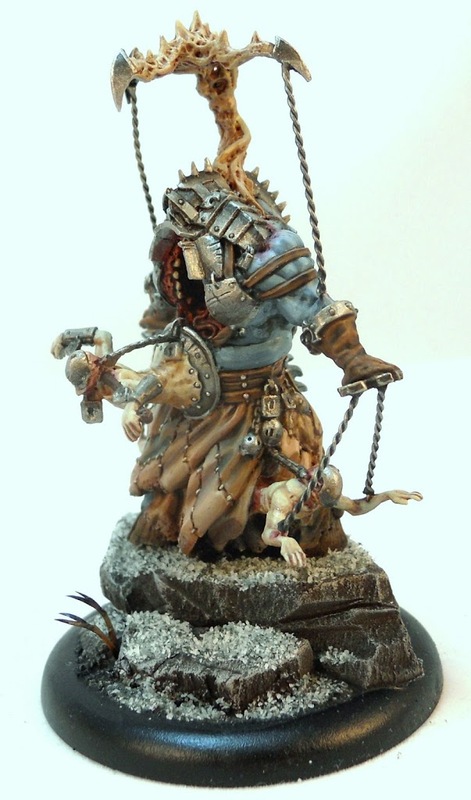 These pale blue and pale yellow tones mix to form a nice gross color (almost a pale green) that makes for a great looking diseased flesh tone. I wash the base coat with Reikland Flesh Shade, then drybrush it very lightly with the basecoat color. I start picking out the highlights and shadows a bit more. Some additional Menoth White Highlight is added to the basecoat color to make it even paler. In addition Bootstrap Leather worked great as a shadow tone. And here is everything once it’s been blended in a little bit better. I add a little bit of blood to some of the more distressed flesh areas. I can never find a blood ink that I really like, so I’m always trying out different mixes of my own. This particular ink consisted of Reikland Flesh Shade, Druchii Violet, P3’s Red Ink and just a drop of P3’s Green Ink. I also begin Eurynome’s own skin with a basecoat of about a 2/3 mix of Exile Blue and Beast Hide. I begin adding Highlights to the skin by mixing in some Ryn Flesh to the basecoat. More Ryn Flesh is added to the blue base color to create a final highlight. At the same time the shadows are darkened with a mix of Exile Blue and Umbral Umber. Since Eurynome’s armor cuts into the flesh of his shoulders, I add some of that blood ink mix to that area. And while I have that ink out, I also start on that nice gross interior of guts and organs. At this early stage that just involves a basecoat of Khardic flesh washed with that blood ink. 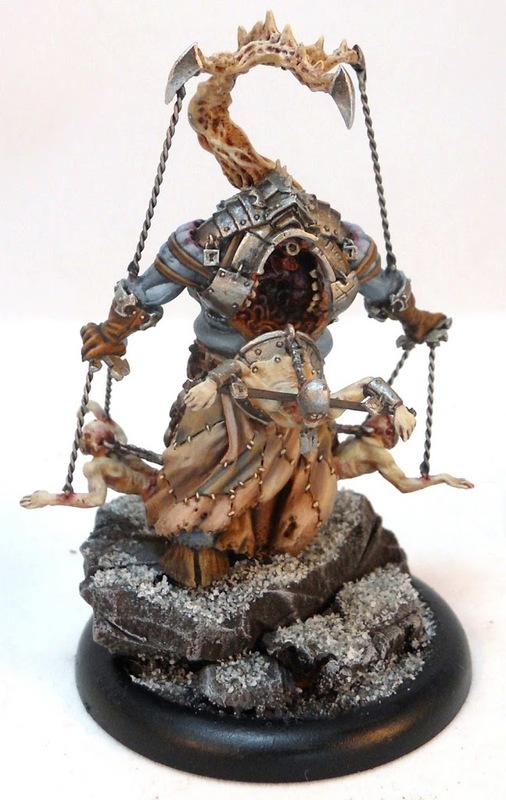 I also start on the leather regions, basing them with Umbral Umber. The metal on the armor gets a basecoat of Radiant Platinum, and the skin skirt I have planned gets a basecoat of Bootstrap leather in a few areas. As you already saw I’m planning on giving it a patchwork look. I begin shading the armor with a mix of Thamar Black and Umbral Umber. Here’s the metal once the shading has been blended in a bit more. 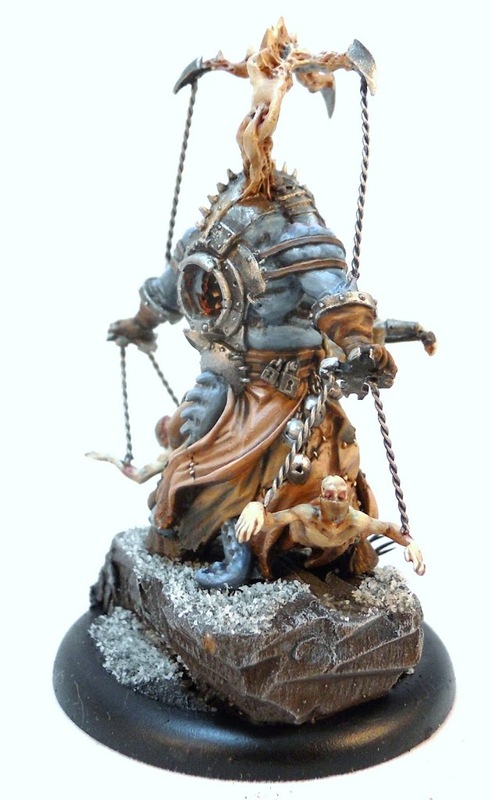 I always find it difficult to get good WiPs of metals so here a couple of other articles where I’ve gone into the technique. The next step is to move onto the leather. 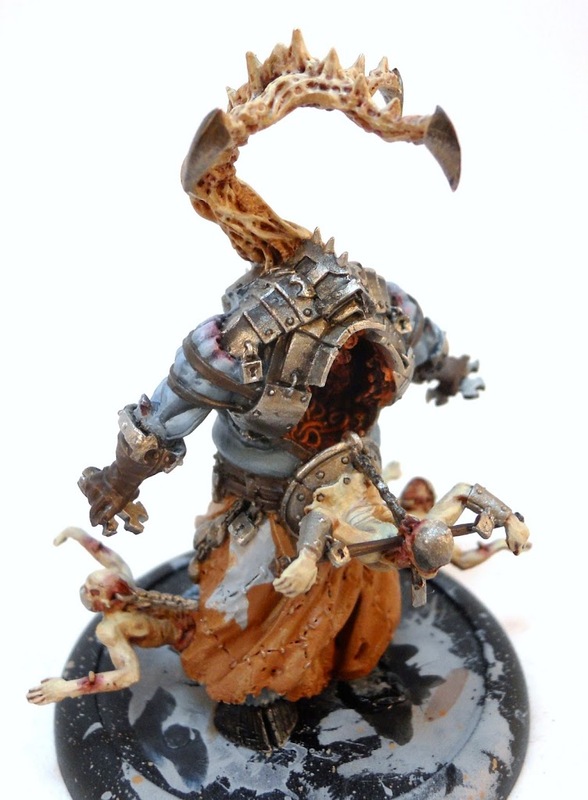 I highlight the Umbral Umber with some Bloodtracker Brown. I finalize the leather with some extra shadows mixed from Umbral Umber and Exile Blue. 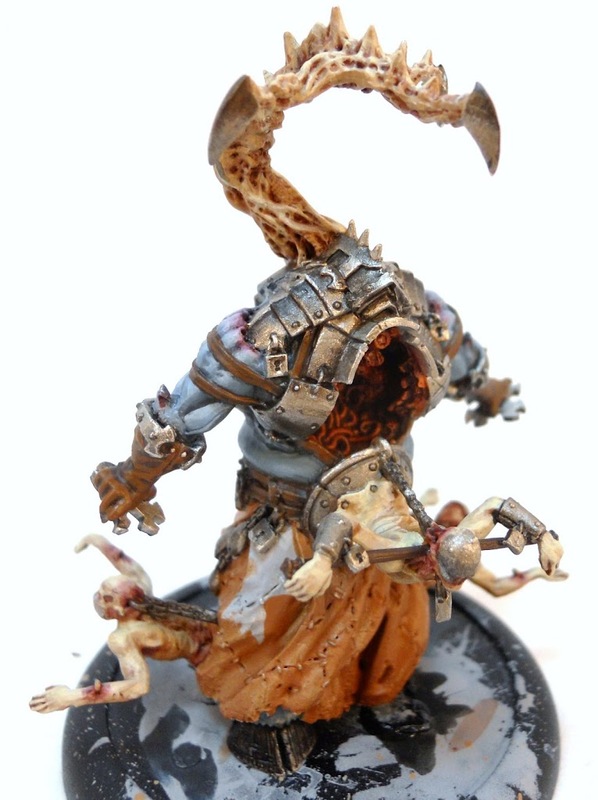 I also add some additional highlights by mixing in some Rucksack Tan with the Bloodtracker Brown. I also begin work on the skin skirt. I add some Ryn Flesh to the Bootstrap Brown for highlights, and Umbral Umber for shading. There were two other flesh tones I wanted to add to the patchwork skirt. One of them begins with a basecoat of Idrian Flesh. 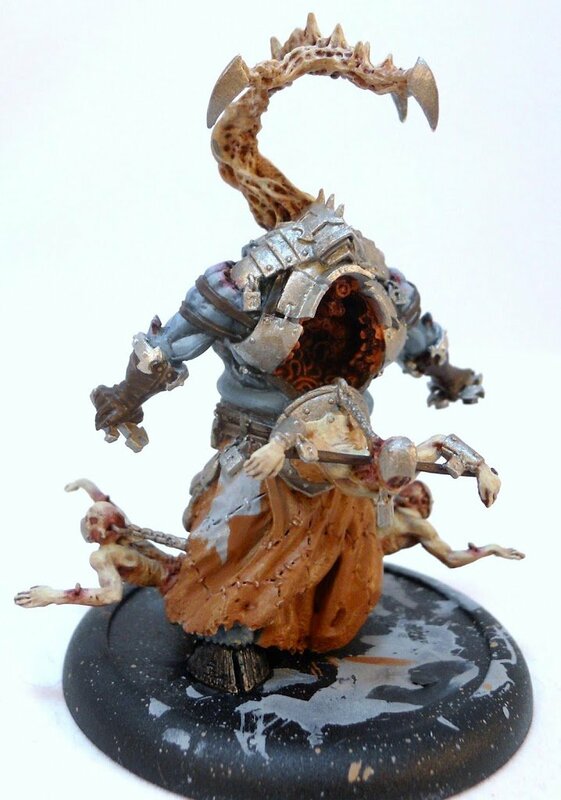 This is highlighted with Menoth White Highlight and shaded with Umbral Umber. The other tone starts with Gun Corps Brown and is shaded with Exile Blue and highlighted with Ryn Flesh. While it’s difficult to make out, I also finished off Eurynome’s lovely interior at this point. 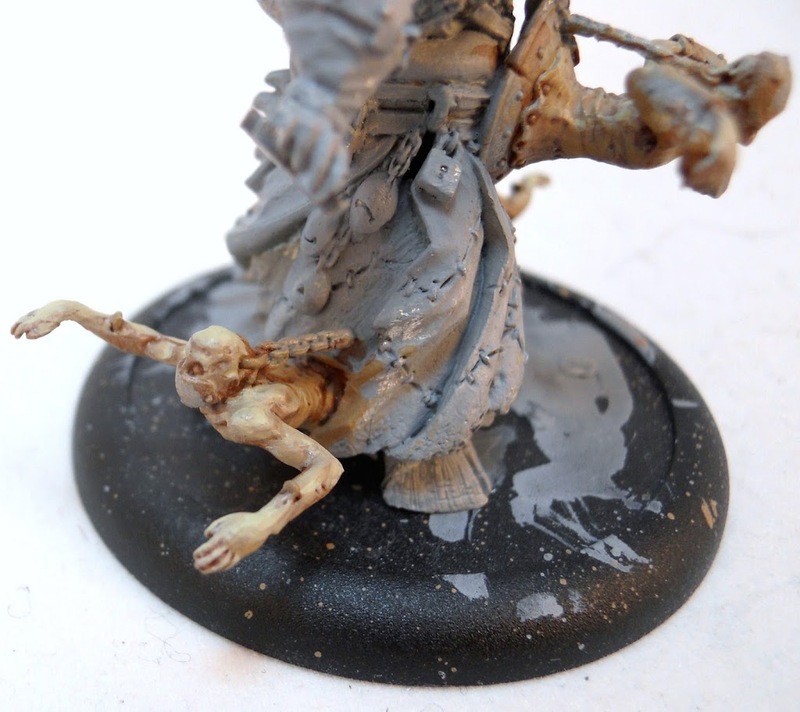 The bones had already been picked out with Menoth White Highlight. 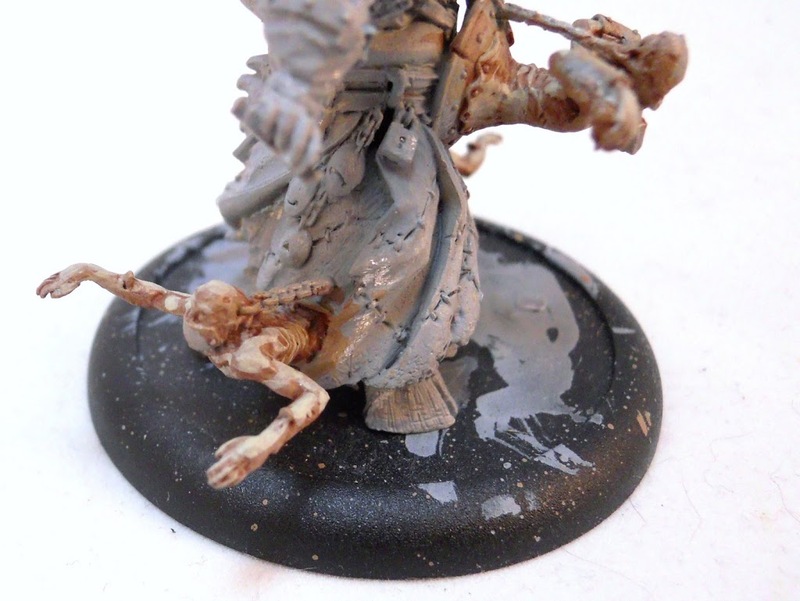 The entrails were highlighted with Ryn Flesh mixed with a tiny amount of the blood wash I mixed earlier. 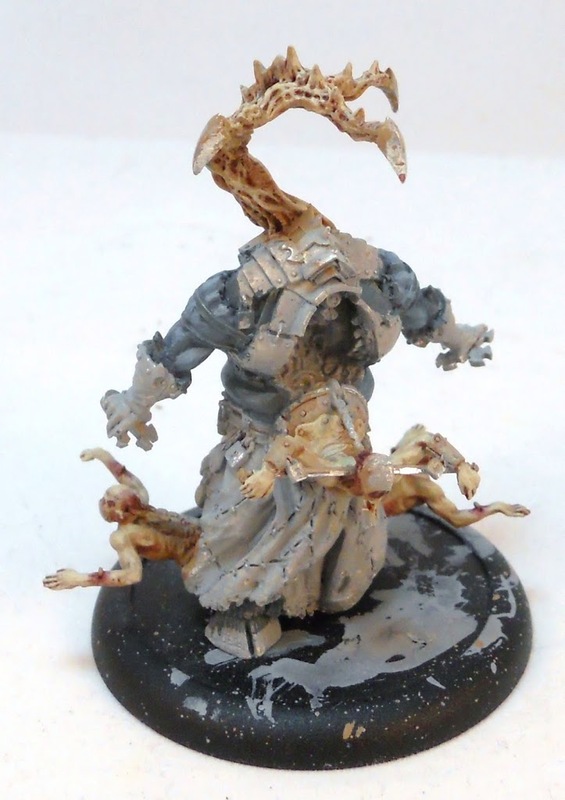 I drybrushed the lungs with some Midlund Flesh and then gave them a thinned down wash of Druchii Violet. There isn’t much left to do at this point. I had to finish off the hooves. I drybrushed them lightly with Rucksack Tan and washed them with Agrax Earth. I had to make the puppet strings myself; the kit doesn’t come with them. I used some of my wire “rope” I had left over from my Galleon basing project. Painting it was even easier than making the rope. 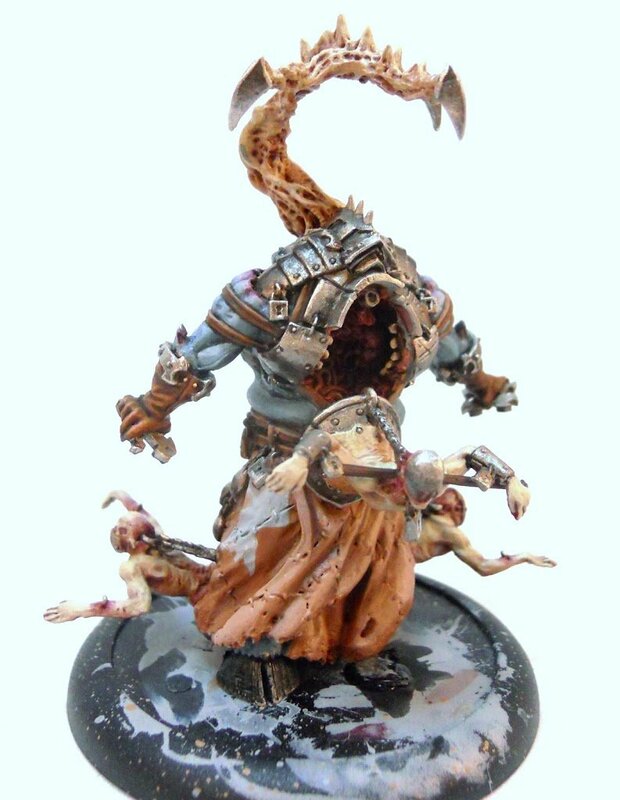 It’s just Radiant Platinum washed with Nuln Oil. For what it’s worth, images of the studio painted Eurynome show a seventh thread connecting the foremost human with the back talon. I left this off of mine because I didn’t like the way this guy looked with a rope obscuring (even if only partially) the front of him. For basing, I gave him, and the rest of my Daemons an ash waste look.I made some boulders by hacking up chunks of blue insulating foam. I painted them with Ironhull Gray, Drybrushed them with Frostbite, then washed them with Agrax Earth. Then I added a generous amount of Gale Force 9’s Ash/Tundra flock. I added some burnt plant parts by painting up some bits of aquarium plants to look dead and burnt. I’ve included a few more angles below so you can try to get a better look at this very strange model. ~And of course Eurynome doesn’t fight all by himself. 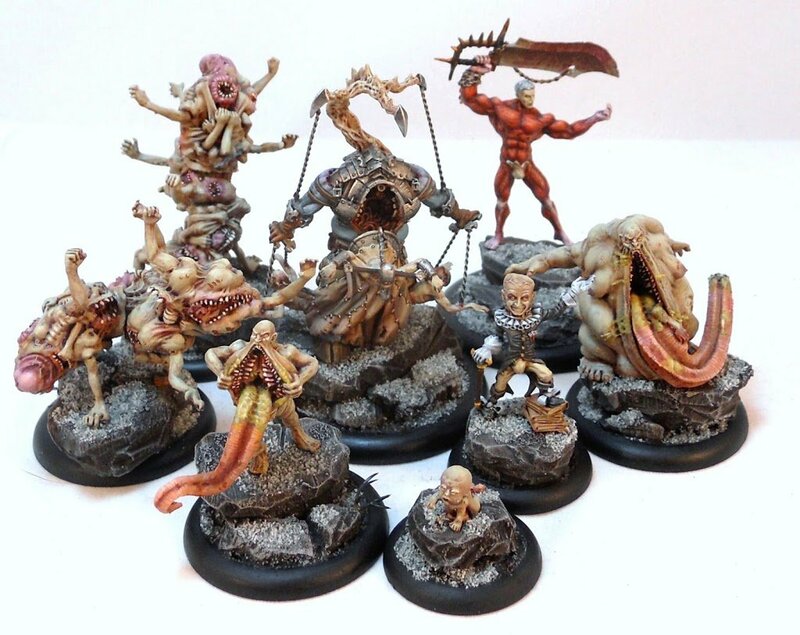 Here’s a look at just some of the other members of his menagerie of horrors. Click and zoom in… if you dare! Pleasant screams kiddies!